Vanilla extract and vanilla sugar are both used as flavoring agents in a wide variety of baked goods and desserts. You can use them interchangeably, as long as you’re careful to keep the overall recipe amounts the same. Remember to cook with care when using vanilla sugar as a substitute for vanilla extract. 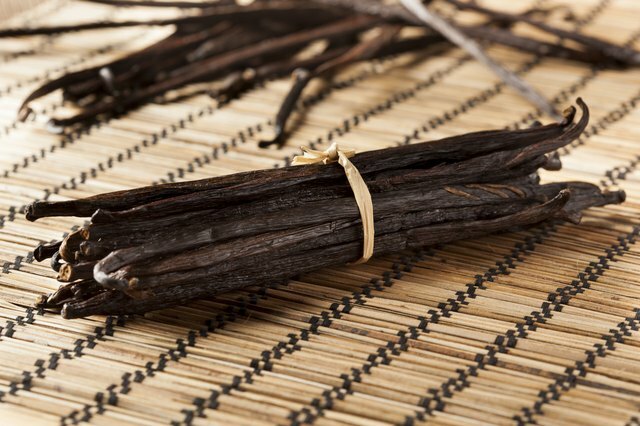 Vanilla extract is made by steeping vanilla beans in a neutral spirit. 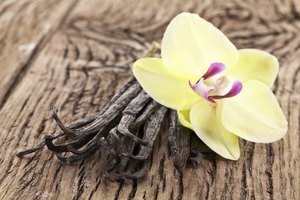 The alcohol extracts the essential oils in the vanilla, and acts as a carrier for the flavor compounds. 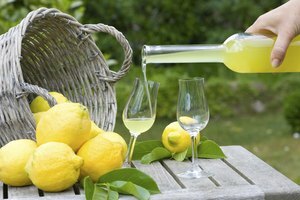 Flavor compounds are what give a recipe that intense, distinctly vanilla flavor. 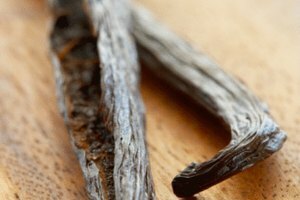 Some less expensive brands of vanilla extract use synthetic vanillin instead of vanilla beans. These products are often referred to as imitation vanilla extract. 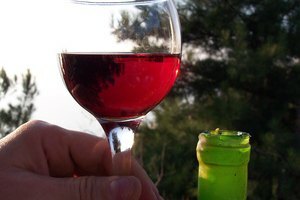 Imitation vanilla extract can be bitter if cooked for long periods of time, but can be used to flavor icings, custards and other dishes if they are added toward the end of the cooking time. If you are concerned about the trace amounts of alcohol in vanilla extract, you can use vanilla sugar instead. In this product, sugar is used to extract the essential oils from the vanilla beans instead of alcohol. Commercially available vanilla sugar tends to be more strongly flavored than homemade varieties. Used alone, it can be a simple way to add interest and flavor to homemade doughnuts, candied fruits or even your morning cup of coffee. If vanilla sugar isn’t available in your local grocery store, you can make your own. If you have a few weeks to wait, split one or two vanilla beans to expose the seeds. Bury the split beans in a 2-cup canister of white sugar and seal it. Shake the canister daily for one week or longer if you prefer a stronger flavor. If you need vanilla sugar right away, you can scrape the seeds from a vanilla pod into a cup of white sugar. Pulse the sugar and vanilla in your food processor until they are combined. Let the mixture sit for two hours to infuse, if you have time and like your vanilla flavor especially intense. In most recipes, you can freely substitute vanilla extract and vanilla sugar. Using Vanilla Sugar Instead of Vanilla Extract: In recipes that call for vanilla extract, use 1 1/2 teaspoons of homemade vanilla sugar per teaspoon of vanilla extract. Add an extra teaspoon of a liquid ingredient per 1 1/2 teaspoons of vanilla sugar to replace the liquid from the vanilla extract. If you have commercially produced vanilla sugar, use only 1 teaspoon of vanilla sugar per teaspoon of vanilla extract. Using Vanilla Extract Instead of Vanilla Sugar: One teaspoon of vanilla extract is the equivalent of 1 1/2 teaspoons of homemade vanilla sugar, or 1 teaspoon of commercially made vanilla sugar. Keep in mind that vanilla extract is not sweetened, so add an extra 1 1/2 teaspoons of sugar per teaspoon of vanilla extract called for in the recipe. There are a few situations where vanilla sugar and vanilla extract aren’t interchangeable. Custards and buttercream icing must have vanilla extract. The granulated sugar in vanilla sugar would make them grainy unless it is first dissolved in a liquid ingredient, such as the cream and egg mixture in custards.